When Will I Get My Roll Fold Newsletters? 5,000 and under Roll Fold Newsletters: Ships or ready for pick up in 2 business days from proof approval. Over 5,000 Roll Fold Newsletters: Ships or ready for pick up in 5 business days from proof approval. Roll fold newsletter printing - put your organization in the spotlight! Open the door to increased readership with gate fold newsletter printing. And when you use the online newsletter printing services of 48HourPrint.com, you get the added benefit of high quality gate fold newsletter printing at prices you can really afford. At the same time, take advantage of our industry-leading 48 Hour Turnaround Guarantee for quantities of 5,000 or fewer newsletters. 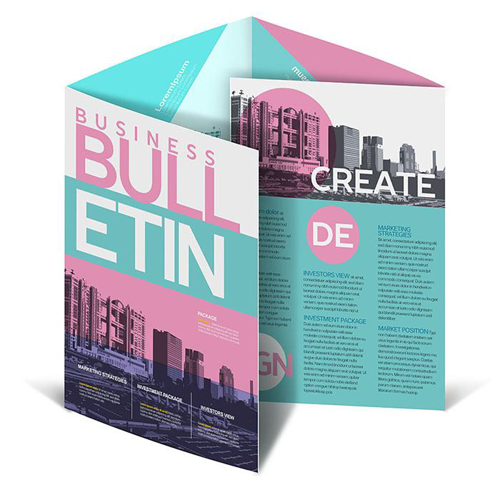 Gate fold newsletter printing creates an inviting newsletter experience. The gate fold newsletter design beckons customers, prospects or members to open your newsletter to see what’s inside. Use stunning visuals and compelling copy on the cover, and readers will be eager to see what else is in store. Gate fold newsletter printing can help boost the chances that your newsletter gets opened and read. In addition to our gate fold newsletter printing services, you can also choose from no fold newsletter printing, single fold newsletter printing, tri-fold newsletter printing, double parallel fold newsletter printing, accordion fold newsletter printing, french fold newsletter printing, and roll fold newsletter printing. We have newsletters covered!